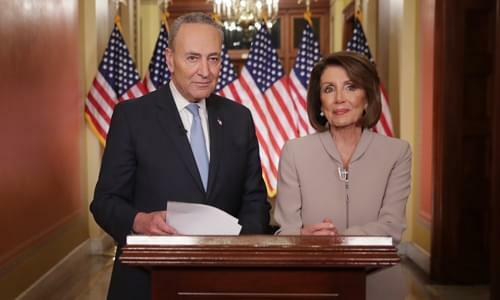 On Wednesday’s Mark Levin Show, Nancy Pelosi and Chuck Schumer claim the crisis at the border is manufactured. Yet Federal law enforcement authorities say otherwise. In a time where everything is a “crisis” the left swoops in to “fix” these crises with more taxes, more regulation, and nationalize private businesses, but that’s not the remedy! The progressive democrats are determined to change the electorate with unassimilated foreigners that have entered the country illegally. The left and the big labor lobby are all for this cheap labor, but this will cost our nation greatly in the long run. Barack Obama turned a blind eye in his second term and, in effect, joined the Koch brothers and the US Chamber of Commerce to continue the influx of illegal immigration. This has only led to chaos at the border and the question is do we want the entire nation to become a sanctuary state? Then, former Border Chief under Obama, Mark Morgan calls in to explain why a wall is necessary at the southern border. Yet Pelosi and Schumer continue to lie saying that TSA is stretched thin creating a crisis at the airports, but the TSA union head disagrees and says it’s simply not true. Progressivism is battling conservatism and America and her President, deserve our support. Afterwards, Conservative Review Editor Daniel Horowitz calls in to discuss the legality of the President’s use of the National Emergencies Act. Finally, is it possible that the Robert Mueller team is coordinating with the Democratic leadership regarding the contents of the upcoming report?